Chimney Saver Solutions provides chimney services in Chesterfield VA and all of Chesterfield County, including the communities of Belmont, Jefferson Davis North, Midlothian, Winterpock, and Gordon VA. Our chimney service trucks can often be seen traveling throughout the Richmond area, including on Rt. 655, Rt. 10, Courthouse Road, and on Iron Bridge Road. Chesterfield had the distinction of being named the 17th Best Place to Live in America by the American City Business Journals, and we are proud to provide our top-rated chimney services to residents in Chesterfield VA and the entire Chesterfield County area. 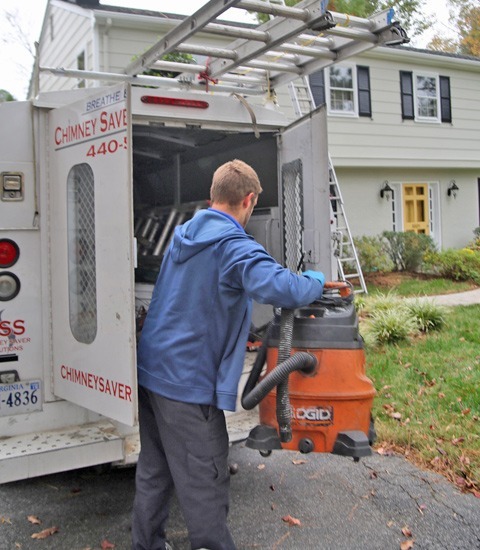 Our chimney sweeps are trusted by homeowners in Chesterfield VA for chimney cleaning, chimney inspection, and repairs because each of our technicians is licensed and certified by the Chimney Safety Institute of America (CSIA). Chimney services and maintenance are important for safety reasons. An annual chimney inspection is recommended by both CSIA and the National Fire Protection Association (NFPA). CSIA also recommends getting a chimney cleaning once creosote buildup in the flue is 1/8” or more, but NFPA recommends annual chimney cleaning in virtually all circumstances. Although chimney masonry can last a century or more, it’s important for homeowners to realize that chimney repairs are often needed and can help extend the life cycle of chimneys, wood stoves, furnaces, and fireplaces. Not only do chimneys undergo basic wear and tear with use, extreme weather conditions can do damage, as well, such as high winds, tornadoes, lightning, and extreme rain. Moisture is often the cause of damage, and our chimney sweeps know the signs to look for that indicate repairs are needed. We make honest recommendations as regards chimney repairs. It is against our policy and we never upsell or advise homeowners they need work that is actually unnecessary. Replacing the chimney liner in aging chimneys eventually becomes necessary, as clay liners deteriorate and crack. Stainless steel liners are recommended because they can provide lasting protection from the threats associated with a cracked or crumbling liner. Dangers associated with a flue in need of repair include exposing the home to toxic gases, including carbon monoxide, and a house fire resulting from combustible materials being exposed to extreme temperatures. Installation of a new flue liner gives homeowners in Chesterfield VA and Chesterfield County peace of mind and also improves operation of stoves and fireplaces. Our chimney professionals always check chimney crowns when conducting chimney inspections because the crown provides important protection against moisture. When cracks develop, they need to be repaired as quickly as possible, so that moisture doesn’t enter the chimney system and cause further damage. We recommend waterproofing as an added safeguard against costly damage caused by moisture. Another important service our chimney experts provide to homeowners in Chesterfield County, including in Chesterfield VA, is to install chimney caps and chase tops. These essential appliances keep animals, birds, twigs, leaves, and other types of debris from entering the chimney. Of course, they also keep out rain, snow, and sleet. Wire mesh on chimney caps and chimney chase tops adds extra protection by acting as a spark guard, so that hot embers are far less likely to start a fire on the roof or other nearby combustibles. Chimney rebuilds and restoration are commonly needed in Chesterfield VA and throughout Chesterfield County, whether from damage caused by moisture or due to age of the chimney. It is not unusual for a chimney to need a full or partial rebuild, especially if a chimney has not been maintained over the years. There are times when scraping out weakened mortar and replacing it between the bricks can suffice; this procedure is known as tuckpointing. You may have a leaky chimney and not realize it. Very often, a chimney is leaking for one reason or another, and undetected damage is being done. Schedule a chimney inspection now, so that repairs can be made before further damage occurs. We recommend that our Chesterfield VA customers do things such as repair flashing, repair broken gutters and downspouts located near the chimney, and prune trees near chimneys, since these situations and more can cause masonry to deteriorate and allow extensive moisture damage to occur. Fireplace insert installation for wood, gas, or pellet fuel is the most cost-effective way to transform an inefficient fireplace into a cost-cutting heat supply. Our experts at Chimney Saver Solutions have sold and installed many fireplace inserts and stoves in and around the Chesterfield VA area. By putting your fireplace to work with an insert, you can rely more on your solid fuel appliance and less on expensive central heating in winter. We have sold and installed many stoves in Chesterfield County and throughout the area. Modern wood, gas, and pellet stoves are remarkably efficient and far superior to stoves of the past. Our trained experts can provide professional installation, which ensures maximum safety and efficiency. Our experts will help to assess your specific needs and make suggestions regarding the stove that best fits your needs. Contact us today for a new wood stove or fireplace insert or to schedule a chimney inspection and cleaning.